Highest peak on the Seaward Kaikoura Range, Manakau is a major climb with a large height gain. In summer it is barren, hot and dry, in winter a long snow climb during short daylight hours. In fine weather the views are magnificent. The first ascent is thought to be by James Ingram in 1874. From HAPUKU RIVER Follow the Hapuku River north branch, at first easy, then quite bouldery, for about 3.5km to a small grassy flat. The old Barratts Hut is about 600m further upstream (well worth a look), and the new bivvy is a bit further on. 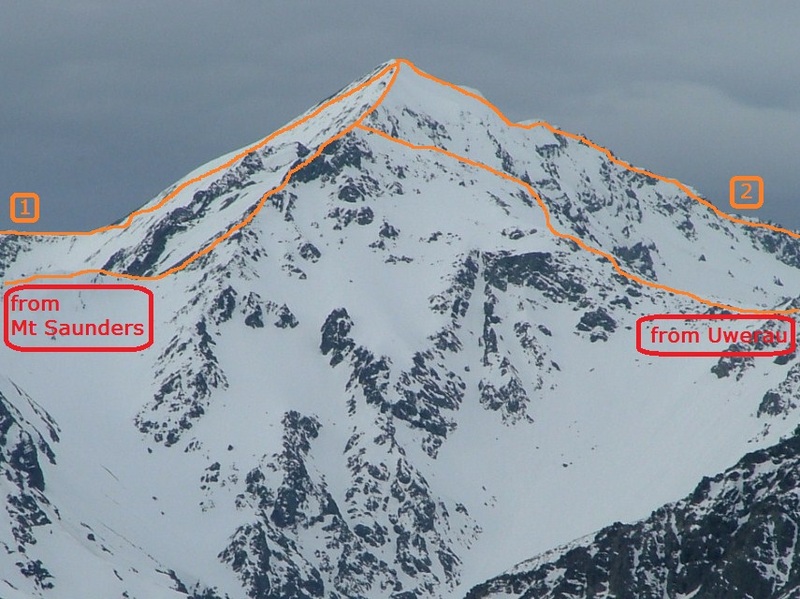 The summit is an 1850m height gain, so it’s best to camp higher if possible. Surveyor Spur is the spur between Mt Stace and the main range. It is easily reached at a small saddle (1045m) directly up from the grassy flat, then follow the spur. There is a good campsite near some large boulders at about 1940m, and in winter and spring there will usually be snow hereabouts. Elsewhere the spur is waterless. Angle up easy slopes to an obvious dip in the main range. In summer it may be necessary to camp in the Stace Creek basin below this dip. Continue along the ridge crest, which steepens beyond a shallow saddle, and bypassing some gendarmes on the north side. Inexperienced parties may prefer a rope here. The traverse to Uwerau is generally straightforward and especially satisfying. A good alternative route to the top of Surveyor Spur starts from map ref. O31/659850, upstream of Barretts Bivvy, meeting the spur at 2000m. At a large cairn before the first major tributary on the true right, look for a plastic road marker pole. Initially follow through fern, then move left onto a steep open slope with tussock and scrub. Keep left of all major slips. From a small grass terrace, route climbs through alpine shrubs, lightly cut. Occasional poles mark the route, however most are not visible from above, hence this route is difficult to follow as a descent, especially if snow covered in the alpine scrub section. Then follow a narrowing ridge. At about 1300m is a small open bivvy site (no water). The route meets the main Surveyor Spur just above the 1940m campsite. A more detailed description is in the hut info folder in the bivvy. From HAPUKU RIVER Has been climbed in spring conditions, but this is steep and rugged terrain, guarded by a gorge and waterfalls in Stace Creek. Via CLEARANCE VALLEY Another very long route. Cross Haycock Saddle (see route 2.05) and pick up an old overgrown pack route, which sidles westwards and descends to Fidget Stream. Gain the ridge on the true left of the stream by any convenient side spur. Abseil into the crux, an 80m deep notch. Continue climbing on solid rock till a second 25m deep notch is reached, abseil into this, and then easier ground to the summit. Dave Barker, Roger Redmayne, Trevor Bissell, Bruce Anderson, Feb. 1986. Via CLEARANCE VALLEY. Another very remote route. Dubious Stream can be reached from Fidget Stream (see North Ridge) via Spring Gully and Packers Stream, or else by the 4WD track on the south bank of the Clarence via Quail Flat. 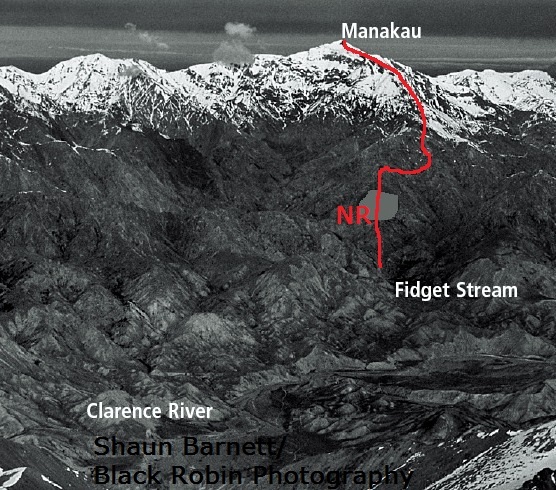 A high scree basin north-west of Manakau can be reached via a main eastern tributary just upstream of Lacebark Stream.